Ice makers seem like natural additions to home refrigerators. The refrigerator and freezer already cool your food, so why not create ice for your beverages? However, an ice maker involves a number of more advanced components such as an incoming water line, water storage tank, and drainage lines. If something goes wrong with any of these components – from a tiny leak in the drain line to a clog in the water line, your ice maker may stop working. Worse yet, it may start leaking, creating a huge mess in and around the refrigerator. 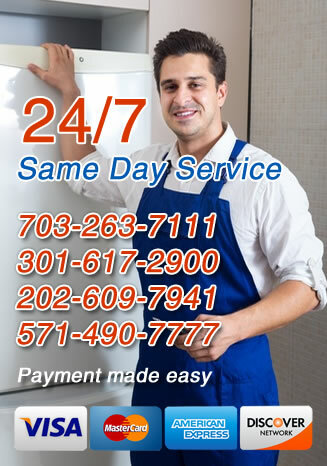 If you have such a problem and need someone to fix it fast, call All Time Services for ice machine repair service in Virginia, Maryland and Washington DC. 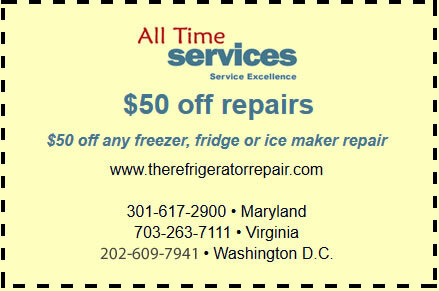 Our refrigerator repair technicians specialize in ice maker repairs in homes throughout the greater Washington D.C. area. They’ll come to your home, quickly inspect your fridge, and repair whatever issues may be present. If you want to keep your ice cubes from tasting bad, you should empty and wash the ice bin in your fridge every three months. The ice bin can absorb odors from the food in your fridge (as can the ice itself), so remember to cover food and clean out your entire refrigerator on a regular basis. If you are having problems with your ice maker, give us a call today! The first step is to identify that there is a problem. If a major failure or leak occurs, you’ll probably know very quickly. A puddle on the floor around your refrigerator, no ice coming out of the appliance or strange colors or stains in the ice are all signs of problems that need to be addressed right away. You should also check for smaller signs of problems such as ice cubes that are smaller than normal or that are frozen together. Intermittent ice creation is another sign of a problem and may be due to a clog or a malfunction in the switch. Remember that an ice maker is comprised of multiple parts – using electrical components to operate the device, plumbing to supply the water and the compressor system in your refrigerator to create ice – so any one small problem can create an issue in the entire system. The best rule of thumb you can follow is to call a professional the moment you notice your ice maker acting up. If you notice that your appliance isn’t producing enough ice, is leaking slightly or there is something in the ice, you probably have a problem and should get it inspected quickly, before you’re faced with the inconvenience of a breakdown. In Arlington, VA, Gaithersburg, MD and the surrounding areas, All Time Services is the place to call for speedy and professional ice machine repair service in Virginia, Maryland and Washington DC. We can identify the problem and fix your ice maker quickly. Call us today to set up an appointment.